When I was 11, I hated that boys would tease me because I would read all the time, and my parents wouldn’t let me wear makeup. I was embarrassed, and I wanted to move to Lake Buena Vista and audition for The All-New Mickey Mouse Club. And my mom wasn’t like, ‘Sure Mindy, go ahead and do that!’ She hit me with an encyclopedia, and now I’m perfect. It’s getting so I know a Charlie Grandy Mindy episode before I even see the credits. He’s written a lot of my favorites over the past year or so (except for one slip on “I Slipped”) and has a way of steering The Mindy Project into a perfect spot between hilarity and sentimentality. There are so many great, quick lines (I wish I had just a straight transcription, I wrote down so many favorites), I estimate that his 22-minute scripts have many more pages than the usual fare. I haven’t gone through and charted the whole episode, but it appears that it had a punchline that absolutely landed about once every five seconds. So it’s not a surprise that The Mindy Project would draft Grandy to write an episode that’s a key crossroads for the series: the one where Danny finds out that Mindy’s pregnant. We’ll get to everyone’s thoughts on this latest development in a minute, but first, let’s just concentrate on the magnitude of the episode. It starts with Mindy’s only negative pregnancy text consisting of a popsicle stick she ate off, drew a minus sign on, and peed on. Danny, Mindy’s “Justice Scalia-level Catholic boyfriend” looks hot because he’s off to a shame session at his church (Mindy mutters under her breath: “God”). 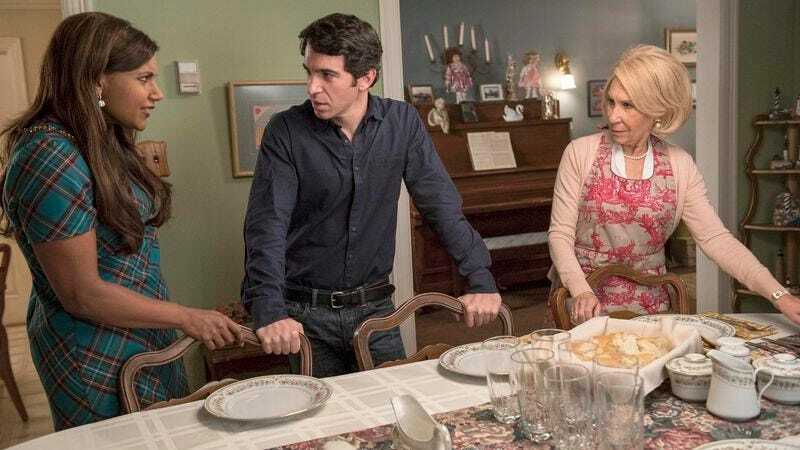 The Castellano family unit we’ve been steeped in for quite a while now comes into play with Danny’s deadbeat dad (Dan Hedaya) and his mom Rhea Perlman (never, ever better). It’s a sharp turnaround for Danny, the guy who barely wanted to call his father in California last season, to agree to take on Little Danny out of a sense of responsibility, basically doing his dad a humungous favor. And although it wouldn’t make much sense for Little Danny to move to New York, you really can’t help but feel sorry for her, saddled as she is with living in the desert, with a 2,000-year-old dad who yells at the newspaper, and a mere 50 channels. Little Danny is the episode’s only misstep for me: headed back to that bleak desert life, but not before she cracks Mindy right across the head, and Mindy retaliates, which Annette supports. Sorry, I just don’t think you should take a brat down that way. Fortunately, tremendous amounts of awesome help overcome the bizarre severity of the slapping scene. Mindy and Annette have definitely had their own journey (and frankly, Annette was almost omnipresent a bit earlier in the season: She had to go away so that we could miss her), but the two have always been such formidable foes and now, almost-friends, and don’t they treat each other like true family members? Throwing guilt dinners and saying that you hate their makeup? 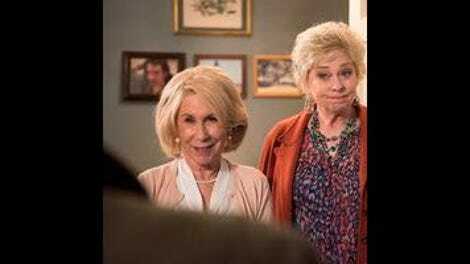 Rhea Perlman completely sells this episode, from her blonde wig to her absurdly out-of-character giggle. Her imitation of a Stepford Wife is spot-on, from her first line to her deadbeat ex (“I’m sorry sir, the soup kitchen is just down the road”) to the positive state of her life now (“I’ve never been happier. In fact, my cheeks actually hurt from smiling so much.” [Smiles.] “Ow!” [Giggles.]) It’s almost a relief when she pulls the wig to reveal her savvy self and talks sense into her son, because she realizes how Alan continues to play him. Annette is savvy enough to really know the Castellanos, which makes her realization about Mindy’s pregnancy at the end all the more delightful: Who else would know what it’s like to have a little Castellano furnace baby inside her? But do you have to be related (or married) to someone to really know them? Mindy pegs Little Danny’s situation immediately, because she was once also a teenage girl trying to get out of things like gym class and chorus practice: “The age-old tactic of acting like a psycho to get what she wants. I know that because I invented that!” Mindy also knows how to get straight to the heart of a teenager: her phone (“I hope she has underwater minutes!”). Danny tries to protect Mindy by saying that “Dinner at the Castellanos is something only the family should see.” Most of us have craziness in our families we try to hide from our significant others as much as possible. Our families reflect us, so opening up that circle enough to let in someone else can be a terrifying moment. If our partner doesn’t like our family, does that mean that they eventually won’t like us as well? For Annette and Danny, Mindy’s pregnancy = instant family. But Mindy gets sold short by not being treated as family before this. She took Annette to her mammogram, for God’s sake. After all she’s done for the Castellanos, nothing was really official for them until this pregnancy, and what does that mean for the future? Yes, babies have often been a death knell on the sitcom circuit. Yes, this will change Danny and Mindy’s relationship irrevocably. But, as always, I have faith in The Mindy Project. If anyone can make this situation funny, writers like Charlie Grandy and Jeremy Bronson and Kaling herself can. Mindy’s pregnancy eating habits alone should be off the hook: What would Danny have done without the trail of apple-pie wrappers to follow Mindy by? We can all ponder what made Kaling and her staff decide to go this route. But episodes like this one, like so many before, prove to me that The Mindy Project could even make pregnancy funny. I gave a long-overdue shout-out to The Mindy Project Style blog, which lists out all of Mindy’s outfits and accessories (and where you can buy them), in Staff Picks last week. Like Mindy says, her clothes definitely are on the fancier side. Speaking of, Mindy’s Best Outfit: It’s a toss-up this week between two spectacular dresses: black-and-white office outfit and the teal plaid at the Castellano family dinner. After viewing this episode a few times, I realize one of the things that makes it hold together so well: no frickin’ B-plot. It’s almost a relief, even with the lack of Jeremy, Beverly, and Tamra. Mindy continues to have no sense of geography or spatial relations, as she announces that she flew 40,000 miles to spend time with Danny. Maybe that wine-of-the-day club on Danny’s ma really is working. HO gauge = a toy. O gauge = a man’s model train. Mindy’s apple pies look a lot like Hostess’ Apple Pies, which are really delicious, as well as full of preservatives. Nice use of Beyonce’s “XO” at the end of the episode.